These pictures show the relative position of the gathering pallet and the teeth of the hour rack for each of the twelve steps of the hour snail. 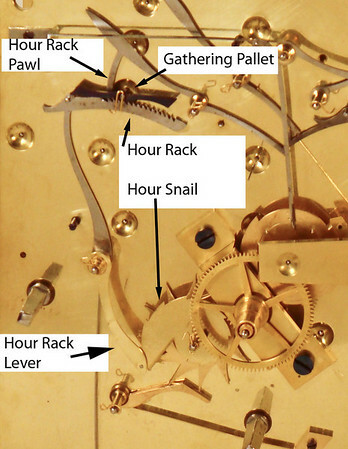 In the photo’s you should note that the hour rack pawl is not engaging the rack – so the position of the rack is due to the hour rack lever resting on a step on the hour snail. The point to notice is that the relative position of the gathering pallet shifts relative to the closest tooth as you step through the pictures. This reflects minor variations in the height of each step on the rim of the hour snail. If the hour rack lever is not adjusted correctly it is all too easy to have the gathering pallet work just fine when initiating the strike for most hours, but, because of variations in the snail, hang up on the tip of a rack tooth for one of the hours. As you step through the pictures in the photo gallery (I found it easiest to click on the “Slide Show” button in the upper right of the photo-gallery screen, then click on the large arrows to the right and left of the picture) you can readily see that the gap between the gathering pallet and the rack teeth is smaller for the 2 and the 7 o’clock teeth. If the hour rack lever was set so that the pallet just cleared the teeth at most positions it could readily foul at either the 2 or the 7 positions. If the gathering pallet comes in contact with the very tip of one of the rack teeth the gathering pallet will hang up, which will keep the clock from striking. It is for this reason that I will typically check that the gathering pallet does not foul the tips of the rack teeth in all 12 positions of the hour snail. Needless to say, I check the same thing for the 4 positions of the quarter snail. The last item in this gallery is a short movie of a quarter-hour gathering pallet that is having problems moving the rack over - because the rack drop is not set correctly. I will cover this issue in more detail in a future tid-bit.